Catholic Schools Week Success, Super Bowl Week and Hoped for Success! Dear Parishioners:We had a tremendous celebration of Catholic Schools Week at Our Lady of Mercy last week. The students who spoke at Masses were outstanding and we thank them for helping spread the good news about the OLM Advantage. We had dozens of families stop by the Open House and look at all the great things happening in our parish school. Also a few alumni of our school visited to see some of the changes! If you attended or graduated from OLM School be sure to check out the school webpage at olmschool.org. There is a section dedicated to our OLM School Alumni. We are always looking to reconnect with our alumni both near and far. I am grateful to our OLM School Principal, Scott Fuller, and the dedicated faculty and staff who worked so hard to make Open House and Catholic Schools Week such a great success. Also we thank the many OLM School students and families who volunteered to help show off all the great things happening at the school. If you would like to take a tour or look around at the school just contact the OLM School Office to arrange a visit. In the name of OLM School, I thank the many parishioners who were so generous in supporting the OLM Saints and Scholars Fund Collection last weekend. This Fund was begun to enable the entire parish to help support the important mission of OLM School. As you can well imagine the cost of operating such an excellent school is very costly. We try to keep tuition affordable and offer financial aid to those qualified OLM parishioners who need assistance. Your generous support of the OLM School Saints and Scholars Fund is appreciated. By the way, the students at OLM School raised $500 which they presented last week to Sister Emma and Sister Lourdes for the good works of the Franciscan Apostolic Sisters in the Philippines. The sisters were certainly grateful for the student’s support. This weekend we mark the World Day for Consecrated Life. In 1997, Pope Saint John Paul II instituted this day of prayer for women and men in consecrated life. This very important day is celebrated in the Church annually on the Feast of the Presentation and in parishes on the weekend following. So please pray for the Franciscan Apostolic Sisters, Sister Emma and Sister Lourdes, and also for Sister of Mercy, Sister Jeanne and be sure to thank them on their special day. 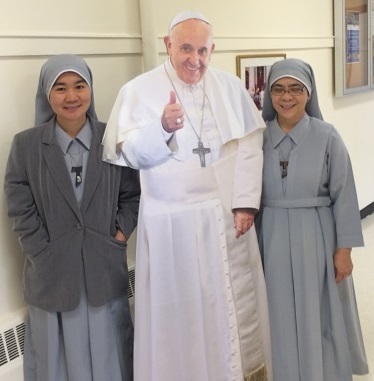 We are so blessed to have these good sisters working and living with us at OLM. Also pray for all those men and women who have made commitments in the consecrated life, and all those considering a vocation as a religious sister or brother. May they continue to be inspired by Jesus Christ and respond generously to God's gift of their vocation. Ben Watson is an NFL star but also a husband and father of five children. He challenged men to support and protect women’s and children’s rights and unborn lives to the fullest extent of their abilities. Ben Watson is a major star in the NFL yet he has the courage and the dedication to stand up for the unborn! Let’s hope Catholic men hear his message and add their voice to defending the voiceless unborn. 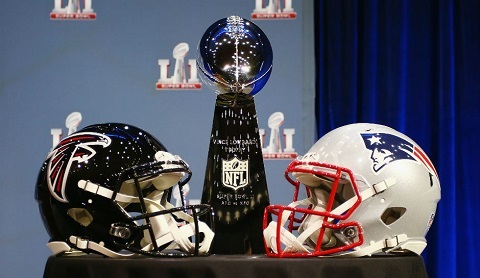 It’s Super Bowl Sunday and we are hoping that our own New England Patriots are victorious tonight! I admit I do like the Atlanta Falcons Star Quarterback Matt Ryan, he is a good Catholic, but I won’t be rooting for him tonight but for the other Catholic and former altar boy, Tom Brady! It should be a great game to watch, so enjoy and root the Pat’s on to victory! Pats 34 and Falcons 31!! Pray for our good sisters this weekend and thank them for their ministry and service to OLM! Be well. Do good. God Bless. Go Pats, Win! !